In farming, just as in any other industry, career, or lifestyle, it is easy to fall into a rut. You want to do what works, right? If it ain’t broke, don’t fix it? You find a pattern, a method of doing things that works well for you, and you stick with it. While this can be effective, it sometimes stops you from trying something new. The pace of change in agriculture is continually astounding. New technologies like drones and robotics will change the way we farm in the very near future. Data-logging and advanced computer programming has revolutionized how we look at our fields, and how we grow our crops. Every year, you have to step up and try some new ideas, or you risk falling into obselescence. For the very first time in our farm’s history this year, we tried straight-cutting canola and planting a cover crop. We also stepped out and bought a weather station, the first of its kind on our farm. While these ideas may not necessarily work out for us, and yes, they can be expensive, how do you know unless you try? Perhaps I should start by explaining just what “straight-cutting” is. In the old days, the only way to kill a crop and dry it down was to swath it. As shown in the photo, you basically just cut the stems and lay the crop into a row. Later, after the swath has dried out, you pick up the swath with the combine and thresh and separate it. The disadvantages of swathing are numerous, but take a look at the swath in the photo. See how bulky and fluffy it is? A strong wind will begin to lift and spread it, which can lead to substantial losses. And, once the swath has been spread out, how do you pick it up? It can become a total nightmare. Moreover, it is yet another pass through the field, which increases fuel consumption, repairs, et cetera. Roundup revolutionized this process. Farmers were able to spray the crop to finish it off instead of swathing it, which is a much safer and faster operation. So why swath canola? Well, unlike our other crops, canola is still not fully “domesticated”, per say. As soon as canola dries down, it immediately begins dropping pods. It wants to reproduce, so this is a natural process. Thousands of years of breeding have selected against that in wheat, corn and soybeans, but canola has not had that long of a breeding effort. To prevent excess losses, conventional wisdom was to swath it and have it dry down in the swath, where that process could be withheld. There is a huge push to develop varieties resistant to pod drop and shatter, and that is finally beginning to pay off. New varieties are now available that hold onto their seeds until they can be harvested. So, armed with these new varieties, we decided to try straight-cutting this year. We were far from first; some farmers have been doing it for years, even without pod-shatter resistant varieties. You just have to time it right and ensure you have a clean, weed-free field, or that you dessicate it at the proper time. While things didn’t quite go the way I hoped they would (I learned patience is a virtue in waiting for proper dry-down) and we had to deal with a very plugged combine (4 hours inside a combine pulling stems out by hand is not a pleasurable way to spend an evening), with all of it now in the bin, I can confidently say we will try more acres next year. It may be a little slower than picking up swaths, but if I can avoid sitting in that stupid swather, it’s all worth it. In the winter of 2014, we spent some time looking at these John Deere Field Connect Weather Stations. The data they were generating was fascinating; imagine always knowing exactly what your soil moisture level is. Knowing what the soil temperature is. Knowing the exact details of each spring frost event, from the lowest temperature to how long it stayed below freezing. Imagine knowing what the humidity is within the crop canopy, and how it changes throughout the day. 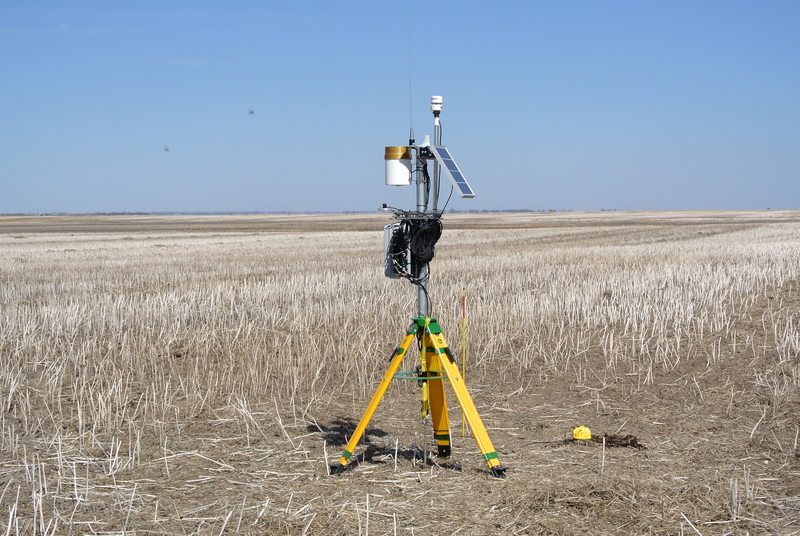 All of these things, and more, are possible with a 3G-connected weather station. While technical issues kept it out of our fields in 2014, we got one installed this year. We planted it in a durum field a few miles from our home farm, way out in the middle of the field. There, it gave us rain totals far more accurate than the plastic rain gauge we have at home, without the usual “did I empty that before that last rain?” Throughout the entire season, I knew how much moisture the crop was using, and how badly that summer heat was hurting the crop. It gave me somewhere to start in the decision of whether the crop humidity was high enough to consider a fungicide. 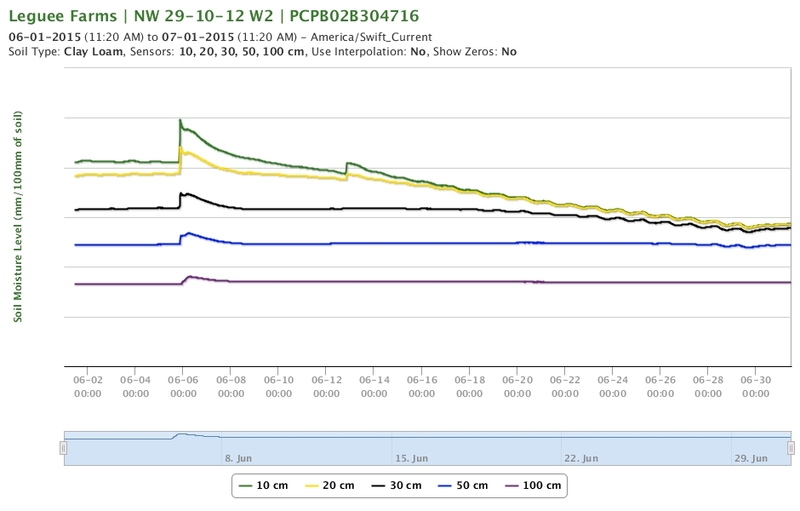 It really has been a valuable tool, and as we learn more about how our crops respond to varying weather, these data from 2015 will be usable going forward to create trendlines. For as long as Leguees have been farming in this area, we have fought with hardpan soil. Roots, unable to penetrate the near-impermeable soil mere inches beneath the surface, are forced to move laterally, thereby competing much more intensely with their neighbours. There’s a reason some of these soils are called “burn-out soils”. Without regular rainfall, roots burn up what moisture is in the topsoil and then run out. Conversely, heavy rainfall creates pools of water on these spots and the crop drowns out. We have tried many different crops with different rooting styles to try and find something that would punch through, but to no avail. 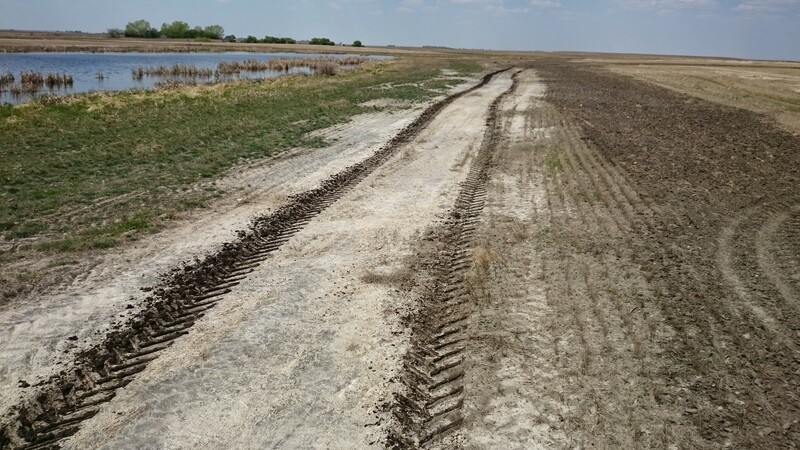 The only option remaining is to deep rip it mechanically, which is expensive, time-consuming, and not really the best fit for our no-till strategies. That is, until I heard about tillage radish. This amazing plant builds a tuber-root so powerful, it exerts hundreds of pounds of pressure on each square inch of soil. I seeded it just about two weeks ago now. 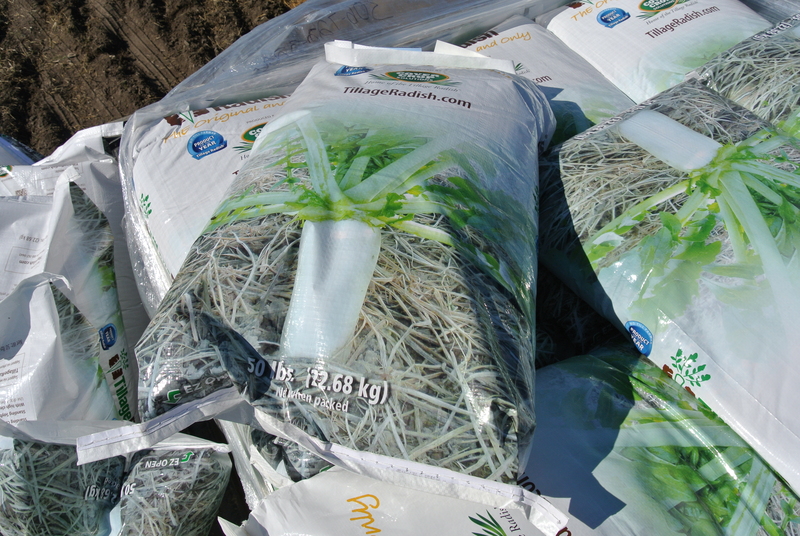 The strategy is to plant it in late summer and force it to focus on its root system. When a killing frost comes along in mid-to late September, the radishes die, and (supposedly) decompose in time for spring seeding. My hope is that these incredibly powerful plants have enough strength to punch through these hardpan zones and create pathways for next years’ crop roots. All of these ideas could someday prove to have been a waste of time and money. You never really know how these things will work out. 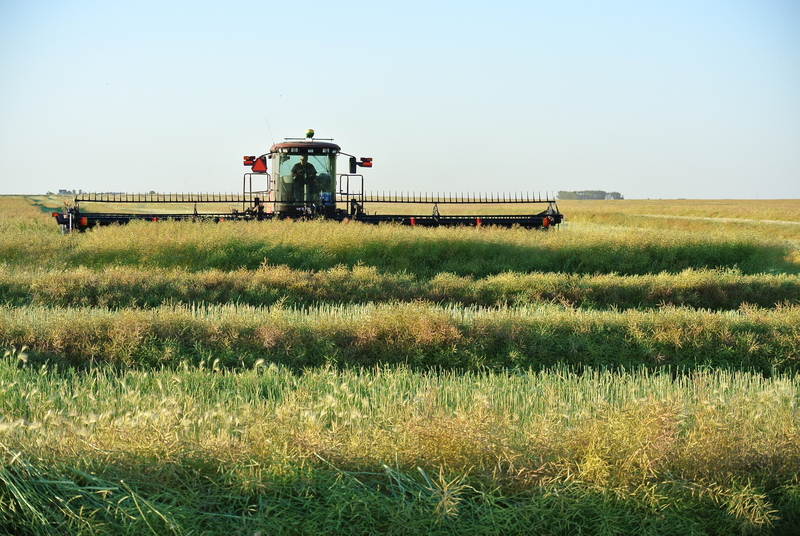 Straight-cutting canola may be a short-term idea, and we may very well go back to swathing. The weather station’s data may prove too complex to be usable for anything more than an expensive rain gauge. The Tillage Radish may fail to hammer through our hardpan soil. If humans thought like that, we would never have landed on the moon. We would never have fed 7 billion people. We would never have tried democracy. At heart, we are all pioneers, striving to continually find new and better ways to do things. To make life better. Farmers were the original prairie pioneers, and we are in an industry uniquely suited to always try and improve on ourselves. Why stop now? For the first time in quite a few years, 2015 is shaping up to be a little on the drier side. We started and finished seeding earlier than most of my father’s career, and precipitation has been mercifully light. Although there is a lot of growing season ahead of us, this may be the drier year we have been waiting for. Despite the drier bias, the effects of excess moisture still linger. 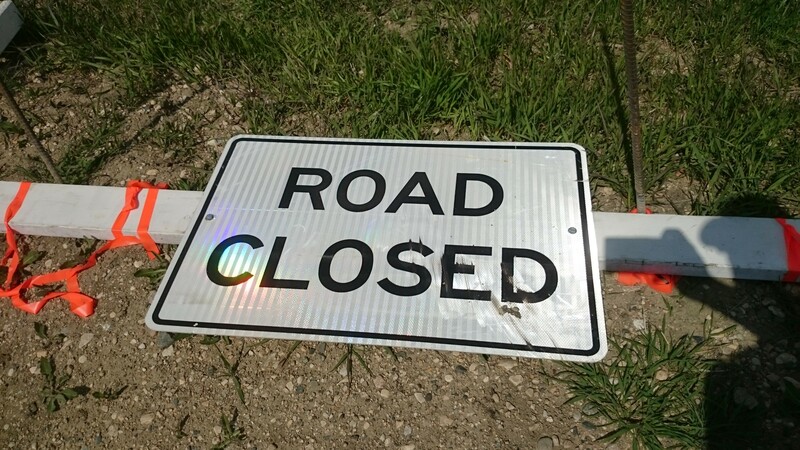 Roads continue to deteriorate, with countless holes and failing sections. Fields are still full of water, with every low spot filled to the brim. Every water body is at capacity, unable to absorb any sudden precipitation event. These are problems that will not just go away, and will haunt us for years. But perhaps the most worrisome situation of all is the frightening, creeping white powder, slowly spreading across our fields, choking out any life it touches… salinity. All of this really began back in 2008. That year, we started seeding in late April into dry soil. With no rains right through May, we finished seeding very early and seeded through every low spot we could find. As the spring came to an end, rains began to come, with a relatively cool summer to go along with them. The result was a fantastic crop by the time we reached August. It was then that things changed. We went to the lake one weekend just before the beginning of harvest. We had winter wheat pretty much ready to go, but, seeing as how it wasn’t quite ready to combine, we took one final weekend off before the long grind of harvest began. Our last day at the lake was a beautiful, warm and sunny day, perfect for being out on the water. But as we started toward home, we saw a cloud that made me sweat. A black, rolling wall was coming right at us, and as we finally reached home, we were hammered by a storm unlike anything we had seen in some time. The damage? Well, there was thankfully no hail, but we received anywhere from 3.5 to 6.5 inches of moisture in that one storm. Harvest was a nightmare, with a count of over 25 stuck combine occurrences, and a crop that had pretty substantial quality loss. Ever since that fall, we have been wet, with varying degrees of successes and failures. 2009, 2012 and 2013 were all very successful years, with lots of moisture and cool weather, but not to the point of extreme excesses. Certainly, we lost a lot of crop in those years to flooding as well, but we did quite well despite that. Conversely, 2010, 2011 and 2014 were either disasters or close to, with 2011 as the year we failed to plant much of a crop at all, with only 25% going in the ground, and most of it being lost. Indeed, for several now we have been stuck in a wet weather pattern, with hammering rains that hit like a wall of bricks seemingly every time a cloud shows up. Finally, it seems that things are changing. We began and finished seeding very early this year, with excellent seeding conditions and lots of subsoil moisture, but very little precipitation, thankfully. While there is a lot of growing season ahead of us, it seems that 2015 is going to be a different year from the previous several. Let’s be clear, though – there is no doubt that we are in a precarious situation. Any significant moisture event could quickly plunge us right back to a year ago. One storm could change everything. 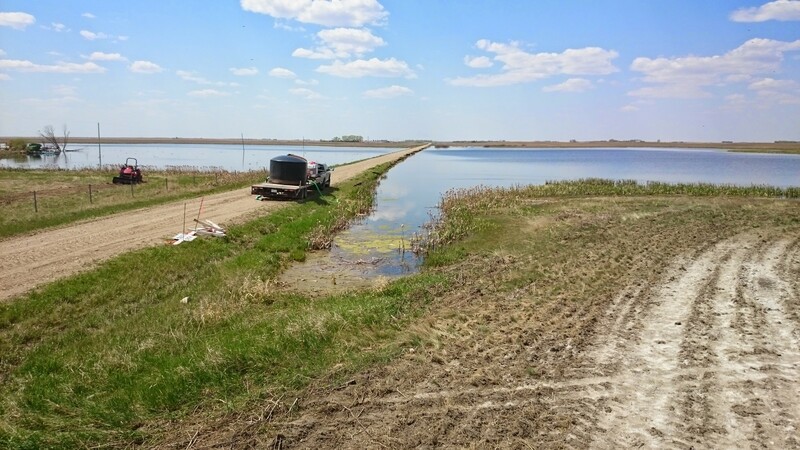 Our roads are becoming increasingly difficult, and expensive, to maintain; as pesky muskrats, emboldened by the acres of water surrounding some roads, dig their way underneath the roads. Numerous sections of roads in the area are in serious danger of becoming impassable with our heavy trucks, which we cannot go without to supply our drills and empty our combines. But, roads are fixable, sloughs will diminish, and drier weather will return. The cycles of climate will return us to drier weather, just as they did after the 1950’s and the 1970’s, along with countless other wet cycles over the millennia. What drier weather may not fix is salinity. The white ring around this slough is referred to as a “bathtub ring”. Nothing will grow in that for decades. Soil salinity is excess salts in the soil, generally made up of combinations of sodium and sulphates or chlorides. Plants can’t access the nutrients they need for life, as the sodium elements in the soil offset the nutrients they need. Trouble begins for plants long before the ground turns white; but once that happens, any life is strangled out. That level of salinity doesn’t just go away, either. It will linger on for my lifetime, and my children’s, and maybe even beyond that. At this time, there is no easy fix for this problem. My father has watched salinity encroach on his land, and his neighbors’ land, off and on throughout his career. The move away from summerfallow and cultivation to continuous cropping and no-till helped enormously, stopping the growth of that creeping white death in its tracks; but it was also drier at that time, from the late 70’s through the early 90’s. Growing crops keeps water from collecting on the land. As water builds and then slowly evaporates away, it often leaves behind a salty residue. Salts also come from the parent material, pushed up by excessive groundwater. But lately, even the good land has developed salinity, which has rarely been seen before . Lately, there has just been so much water that we can’t grow enough plant biomass to soak up the salts. As the salts build up, crops struggle even more, and it becomes a bit of a cycle. It is a common problem in irrigation areas, which just goes to show how much water we have gotten in the past few years! Is the problem with us, the farmers? Are we working our land too hard? My estimation is that no, that is not the case, as I have seen salinity grow even in the native prairie community pasture just north of my home, choking out the mixed grasslands. This is a problem with the soil itself, with the weather patterns we are experiencing. What can we do about it? I’m really not sure. This isn’t one of those issues with a simple answer, something that the government can come in and regulate away, or even something that we farmers are necessarily even mismanaging. What we need, I believe, is a change to drier weather. And for the next wet weather cycle that rolls through in ten, twenty or thirty years from now, we need a plan. And drainage may just have to be a part of that plan. Soil amendments may be an answer as well; applications of gypsum have helped in some scenarios. We are currently experimenting with that. If we are moving towards a drier weather pattern, that will help remediate many of the issues we are currently facing. I want to be clear, too, that we are far from being the worst-affected area from this weather. Many farmers have lost much, with water even threatening their yards. I consider us lucky to have avoided that scenario. It could be much, much worse. Nevertheless, excess moisture has become a serious problem, and it is about time it starts to fade away. I hear a lot today about lower grain prices, and the effect it has on farmers. If you spend too much time listening to the rhetoric out there today, you might wonder why you’d want to farm at all! This past year, prices for most of our crops tumbled to a level not seen in many years. And, there seems to be an opinion pervasive among those in the media that the downtrend will continue. Are farmers doomed? Back in 2005-2006, when I was just finishing high school, agriculture was suffering some very hard times. Making a profit from farming was difficult, to say the least. Perpetually low grain prices plagued farmers during that time, indeed for the past decade. Why bother continuing? Why bother doing all that hard work, just to scrape by year after year? Fortunately, times were changing. World stocks of wheat, corn and soybeans were quietly dipping lower and lower, and signs of better times were ahead. You see, as farmers, we are directly impacted by the laws of supply and demand. Poor crops in one area of the world makes for better profits for the rest! (Don’t worry, we all get our turn at that spot). Grains and oilseeds were becoming so cheap that people actually had the idea to use them as fuel. Whether that makes sense or not is a discussion for another day, but the explosion in ethanol and biodiesel, combined with a lack of motivation on the part of farmers to really push yields, created the beginning of one of the greatest “bull” markets (upward-trending) in history. From 2007 on, farmers finally were able to make money growing crops again. Interestingly, my Dad experienced an eerily familiar situation at the start of his farming career in the 70’s. At that time, they were bombarded with claims that the world was running out of food, that demand from growing economies like the Soviet Union would make them rich for the rest of their careers, and that they had to do everything they could to push yields to feed this growing world. All of the sudden, agriculture exploded from obscurity, becoming front-page news. Land prices took off, as everyone wanted to own their piece, be it a farmer down the road or an investor from New York City. Sound familiar? Just replace “Soviet Union” with “China and India” and it fits disturbingly well. Throughout the latest fantastic run of great prices, starting in late 2006 and capped off by a severe drought in the U.S. in 2012, we were told that it would go on forever. While all of this was great for farmers, and for my farm too, I knew that reality would set in someday. I knew it couldn’t last. Because, just like everything else, agriculture moves in cycles. This wasn’t the first time grain prices had taken off. In fact, it had happened three times before: after World War I, again after World War II, and in the early 1970’s. Each time grain prices exploded to new heights, and then settled back to reality. This bull market would be no different; and indeed, it wasn’t any different at all. The famous quote, “history doesn’t repeat itself, but it does rhyme,” fits all too well. But what does all this mean? Well, good times can’t go on forever – but neither can bad times. Even at the worst of the low grain prices in the early 2000’s, when all hope seemed lost, when it seemed like farming would never recover – it did. And, even when it seemed like we could never keep up with a growing world, when it seemed like crazy, volatile weather would forever curtail our ability to grow large crops – we did. “The best cure for high prices is high prices” is one thing I learned from a market analyst I have a lot of respect for, John DePutter. By the way, the reverse is also true. Agriculture moves in long-term cycles and waves, going from depressed valleys to exorbitant peaks. The good times allow us to take a breath, strengthen our balance sheets, and try to prepare for the bad times, which inevitably follow. But, the bad times in some ways present greater opportunities, with cheaper land, opportunities for expansion, and a better diversified cropping mix to try and capture special crop market swings. Good times push simple, low-maintenance and reliable crop rotations like wheat-canola (or corn-soybeans for those down south) that are really not a great long-term strategy for improving our soils and preventing weed resistance. 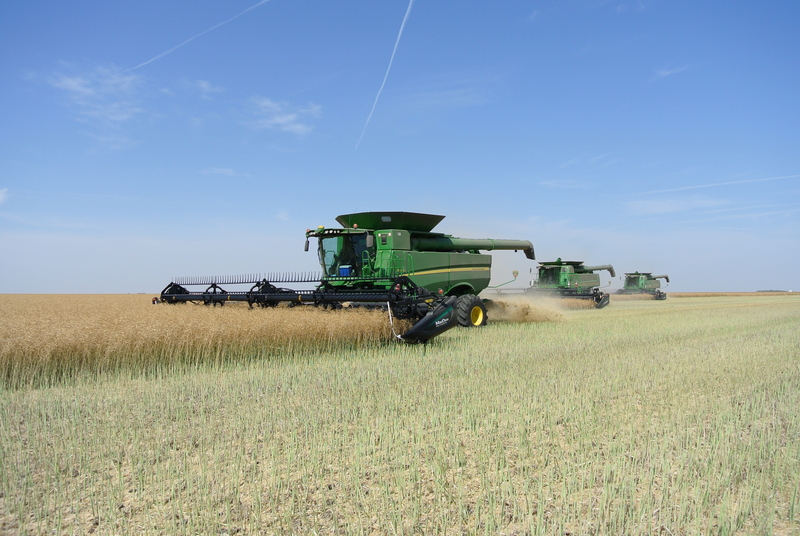 In the next few years, crops like peas, lentils and flax will return from the background (they are already starting to now) and new, exciting crops will find their way to all corners of the Prairies. The “good times” for cash cropping may have ended, and may not return for decades. Yet, it is in these “bad times” that some of the greatest opportunities may be found. Since the amazing explosion in agriculture started around eight years ago, many of us realized that it would not last; that we needed to be careful navigating through it. Now, as we enter into a new era of farming, with technological advances unprecedented in the past, with a new generation of farmers passionate about agriculture, I for one am excited about the future of this incredible and vibrant industry. Do Farmers Actually Work During The Winter? There has been, and continues to be, a long-standing stereotype about what grain farmers do for the winter months. I think it can be summed up as “not a whole hell of a lot”. A great acronym a cattle farmer once told me was that grain farmers are “Triple A Farmers” – April, August, Arizona. Meaning, you work in April through August, then go on holidays until spring comes again. While this little piece of alliteration is concise and entertaining, it is far from accurate in today’s world. However, most stereotypes do have some rooting in truth, and this one is no different. Years ago, most farms were a mix of grain and livestock, partly to diversify their operation and partly because that’s the way it had always been done. Our farm was a grain and cattle operation once upon a time, occasionally with some chickens thrown into the mix as well. Therefore, we were always busy, throughout the growing season and the winter. Mixed farmers often looked with jealousy at straight grain farms, since these farmers didn’t have to deal with livestock throughout the winter. Looking after cattle during the winter can be exhausting, especially if your cattle calve during this cold and brutal time of year. When this was still a very prevalent phenomenon, grain farms were mostly small, and the farm was half in summerfallow (not cropped) every year. So there really wasn’t a whole lot of hauling to do in those times. Generally speaking, those farms had a pretty quiet winter. Things have changed from the old days. Today, many farms are legitimate medium-sized businesses with millions of dollars turning over every year. Moreover, farm sizes are much larger, and most areas practice continuous cropping to keep tillage to a minimum, so production is considerably greater. These factors combine to make winter a busy time on a grain farm, albeit not as busy as the growing season. If it was, farmers would be old men and women long before their time, as you can only run that kind of pace for a limited part of the year. 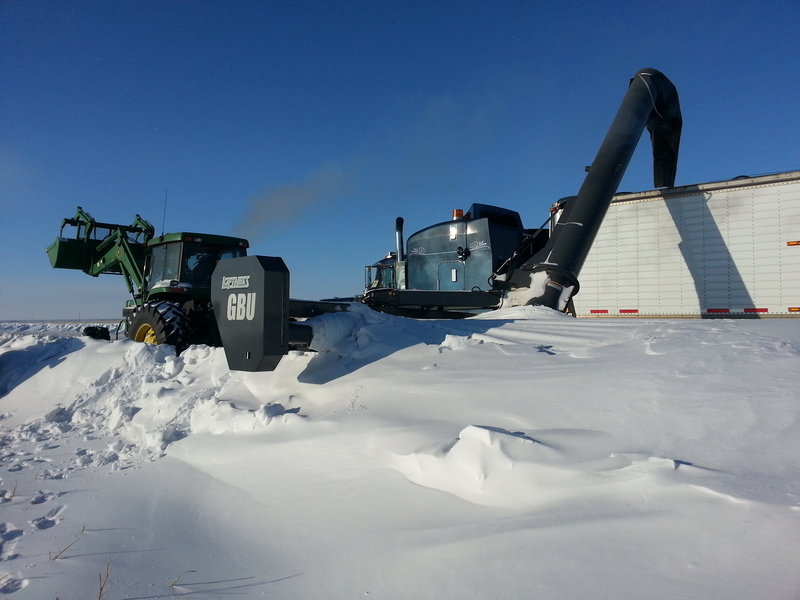 So… what do grain farmers do during the winter? 1. Hauling grain. In a year like this one, there was a huge volume of grain to move, with record crops filling bins, bags, and even making piles on the ground, which is good and bad (click here for more on that). Most grain is actually not hauled off the combine. 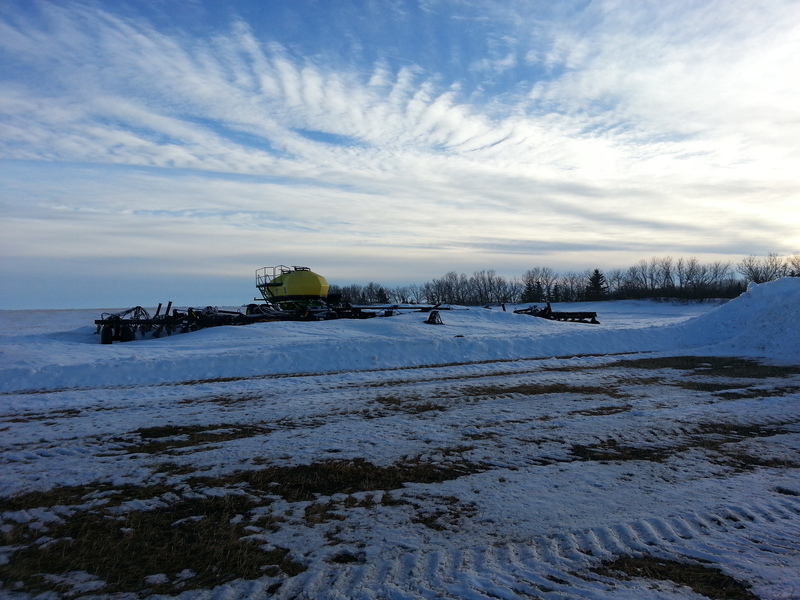 We usually haul around 30-50% off the combine to the elevators, depending on the year. The rest is moved throughout the following winter and summer, and for some growers, even longer than that. 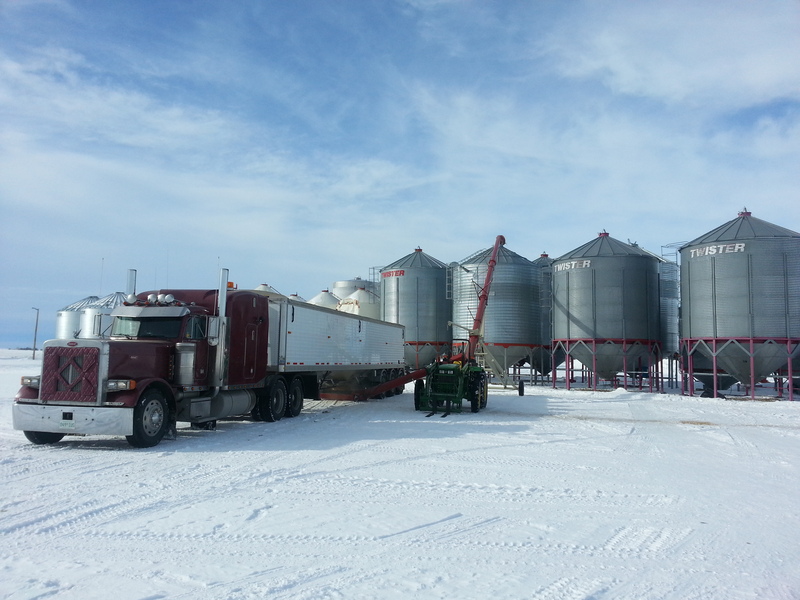 Hauling grain can be a real project during the winter months, with cold, snow, and winds wreaking havoc on moving highway semi trucks around on back roads and in and out of bin yards. 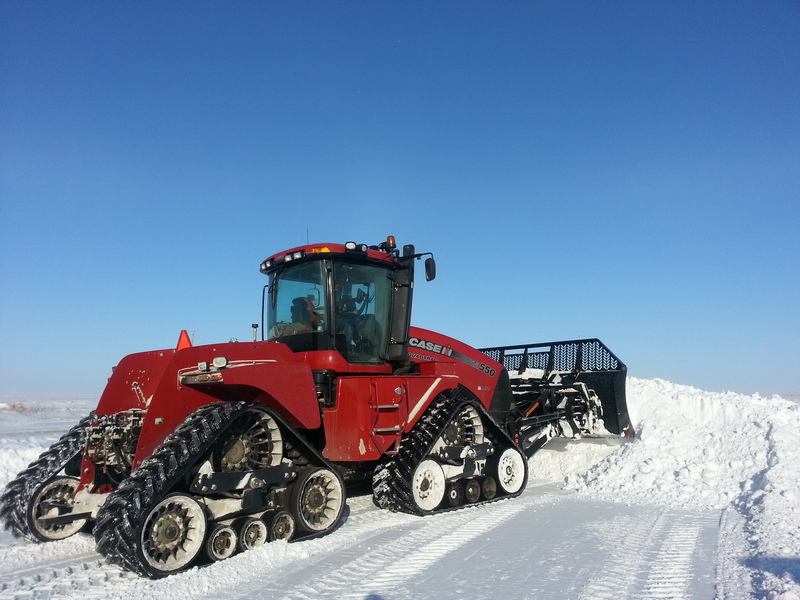 Moving snow becomes a major part of every winter (unless there isn’t much snow) and having good snow moving machinery is vital. We still have some grain bags left to clean up, but hopefully we will get them all empty in the next month before the spring melt begins. You really don’t want to be cleaning up those things in wet, soggy fields. 2. Budgeting. 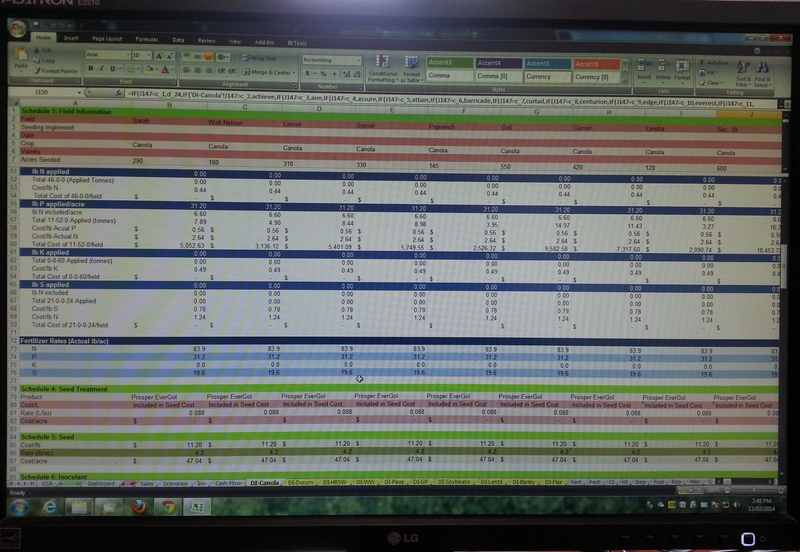 Winter is the time to crunch numbers; determining the profit (or loss) from the previous year, and compiling a budget for next year’s crop to decide which crops to grow and in what amount. We figure out our cropping mix based on the most profitable options and good agronomic practices. Sometimes, we have to grow a crop at a loss because our land needs it for good rotation. Even though it may cost us money this year, it will pay off in the long run. 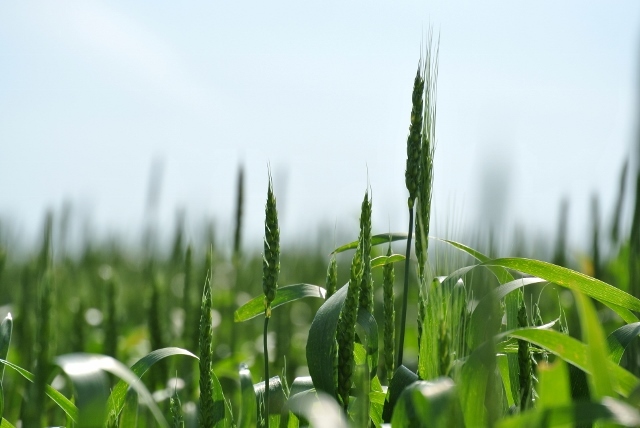 Wheat looks unprofitable this year, but it is a necessary part of our farm’s rotation, and therefore is a required crop no matter what the price is. 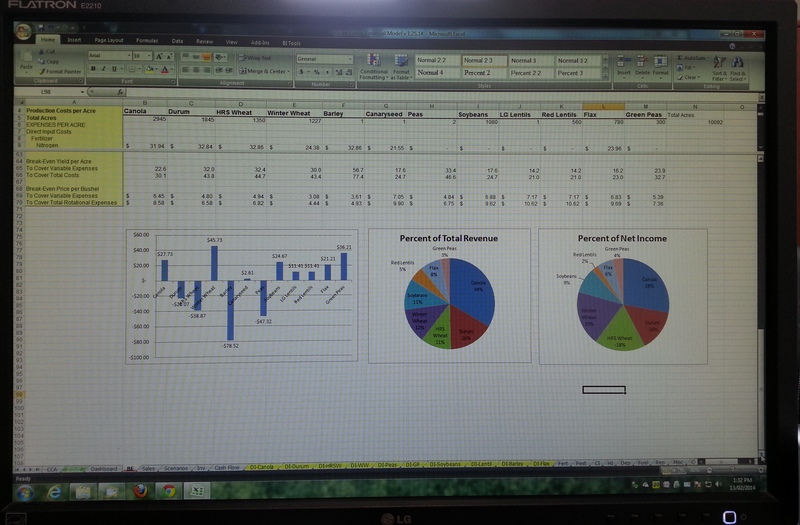 Microsoft’s Excel program is a huge part of my life during the winter, and is where I try to calculate our farm’s input cost down to the nickel. Sometimes, our projections are wrong, so we try not to chase the market too much. Instead, we grow crops we know we can grow well and that have decent looking price prospects for next year. But, it is a total guessing game, as a weather issue anywhere in the world (or lack thereof) can change our ability to make a profit substantially. 3. Preparing equipment for spring. Our shop almost always has equipment in it, from combines to tractors to semis, where we try to do as much preventative maintenance as possible to ensure our busy season goes uninterrupted. The more our equipment is repaired during the winter, the less work we will have to do in the growing season, where finding time for preventative maintenance and repairs is almost impossible. 4. Booking and purchasing inputs. Once we have an idea of what crops we are going to grow, we pre-purchase and book the inputs we need, such as seed, fertilizer, and some chemicals. There are usually discounts for doing so. 5. Meetings. Agriculture is an industry that changes faster than I can even keep up with, so going to winter meetings to keep with new agronomic, marketing and business trends is a must. 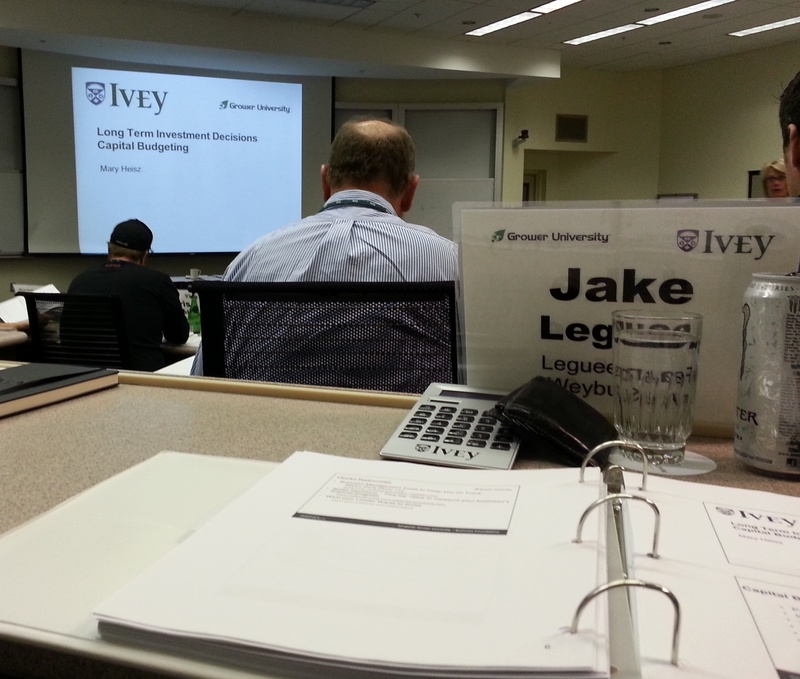 I had the good fortune of attending Bayer CropScience’s inaugural Agronomy Summit in Banff back in November, and I had the pleasure of attending Syngenta’s Grower University at the Richard Ivey School of Business in January. Both were excellent and extraordinary learning experiences that I will benefit from for many years to come (more on those later). 6. Marketing. Don’t let it fool you that this is last on this list. 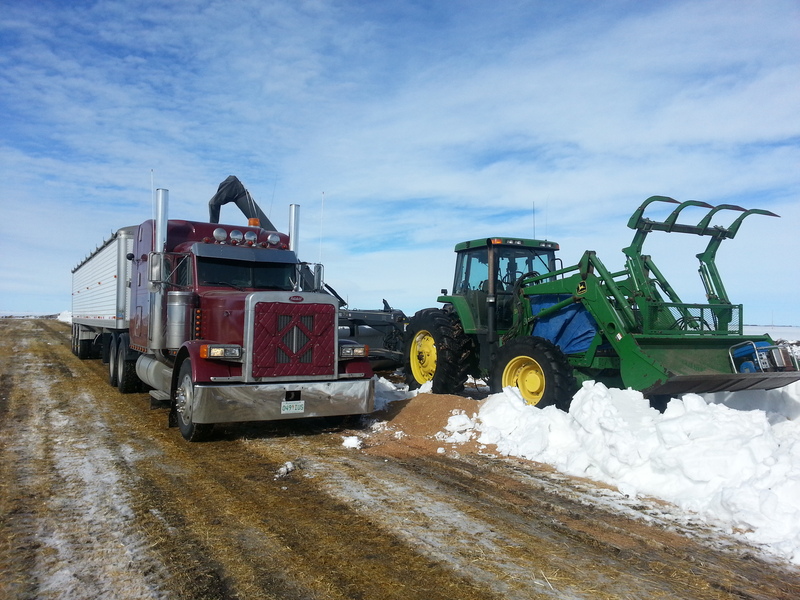 This is the most important job of the winter, and ties together budgeting, hauling grain, and pre-purchasing inputs. The more accurate our budget is, the better we know what price we need to sell at to achieve a profit. We also need to know what our cash flow needs are to ensure we can sell grain at the right times to get our bills paid. Furthermore, we have to be able to actually get the grain moved to get our contracts filled, so keeping an eye on trucking capabilities is vital as well. Finally, after all these needs are met, we try to sell grain at the right times to capture a good price. Our goal is to sell into the top third of the market, which is harder than you might think. Markets sometimes fluctuate wildly for seemingly no reason at all, depending on the moods and intentions of large hedge funds and other speculators. Winter is a time spent in three main spots: the semi, the shop, and the computer. Each of these tasks is equally important to make sure all the work gets done right and on time. However, winter isn’t all about work. Despite how busy it can be, there is a lot of downtime, too. This is why most of our holidays are during the winter months. The growing season is immensely busy and stressful, and winter brings a slowdown in the workload. It is a time to visit family and friends, a time for (some) needed rest and relaxation, and a time for fun. 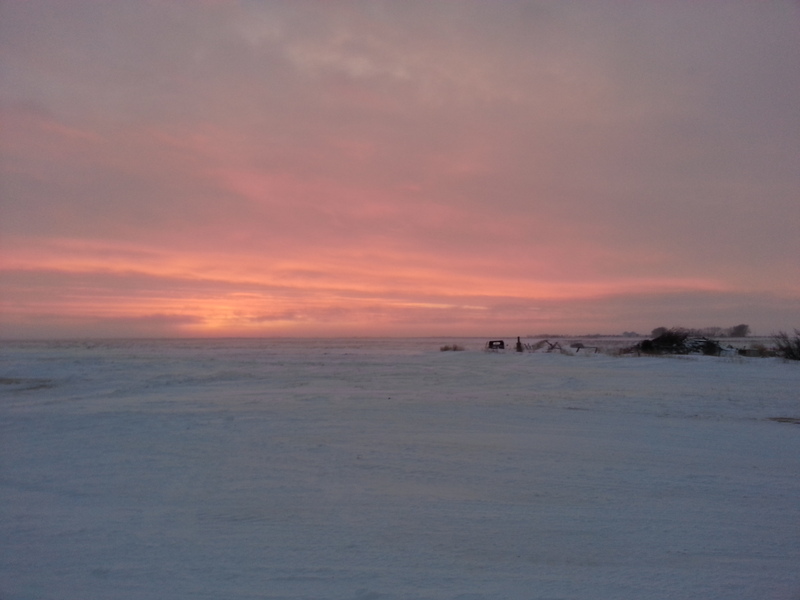 Despite the cold and the snow, winter is a wonderful time to be on the Prairies, with gorgeous sunrises and sunsets, beautiful landscapes and busy small-town rinks with curling, hockey and snowmobiling. Spring will come sooner than we are ready for, as it always does. There is a stirring of excitement brewing in the Prairies; winter is beginning to lose its grip on us, and, even though it is more than a month away yet, spring is coming. Until then, I am going to enjoy the rest of winter, from the short days and quiet weekends to curling and snowmobiling; winter is a wonderful time of the year, and it often goes by too fast (except for last year, that is). And, of course, I will be enjoying watching the Winter Olympics. Good luck Team Canada!